Order online by clicking on the image of the item you want and you will be sent to a website where you may place your order. To purchase ReFire Your Life!, click on the book image and you will be sent to our book fulfillment page at Amazon.com to purchase this book. by James V. Gambone, Ph.D.
Read the Introduction to ReFire Your Life! now. Please contact us for quantity prices: 1-952-472-3379. To purchase, click on the booklet image and you will be sent to our parent company, PointsOfViewInc.com where you may place your order online. The booklet . . .
• How can employers attract, retain, motive and inspire workers of different ages? • How do you keep Boomers fired up and motivated until they retire? • How can you facilitate knowledge transfer between Boomers and younger workers? By outlining the 5 living generations, this booklet helps you to understand why there are generational differences in the workplace and offers tips for how to use that knowledge to create more innovative recruitment and retention policies, flexible work environments, and workplaces of destinationwhere people from all generations are attracted. To purchase, click on the book image and you will be sent to our parent company, PointsOfViewInc.com where you may place your order online. 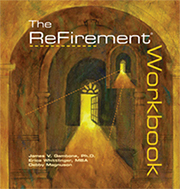 See The ReFirement Workbook Table of Contents and Introduction. To purchase, click on the Report image and you will be sent to our parent company, PointsOfViewInc.com where you may place your order online. A report challenging current assumptions about the Baby Boom Generation! $12 (plus sales tax for MN residents). Allow up to 24 hours for file to arrive in your email box. The Executive Summary of the Report, issued by ReFirement Inc., has key census data. Click here now to read it. Go to the news release for more information.